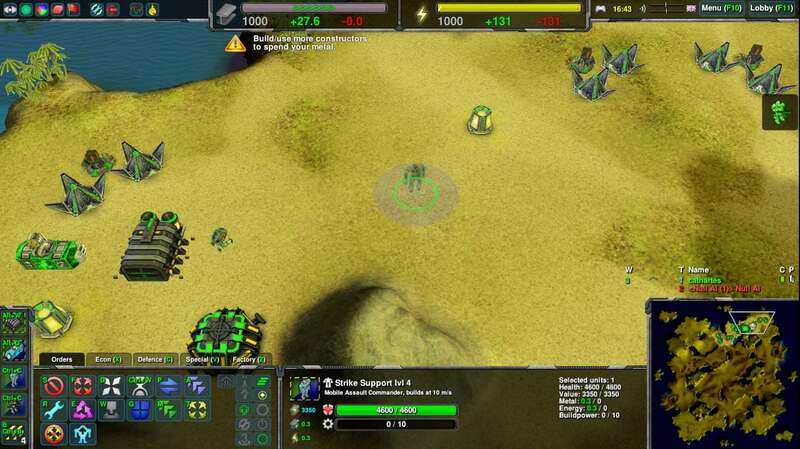 When an area cloaker has the area cloak option enabled, the unit spends self-cloaking energy when cloaked, whether it is under its own area cloak or cloaked by another area cloaker. This energy usage happens even when the unit is powered off, as long as the area cloak option is enabled (even though its own area cloaker is not active when powered off) and the unit is cloaked. When the area cloak option is disabled, the self-cloaking energy is not spent, although the unit is still cloaked if it is under an area cloaker. Energy usage when area cloaker is active is 14.5=1+1.5+12. The self-cloak cost of 1 is redundant when its area cloak is active, so it should actually only cost a total of 13.5 E/s to do area cloaking. Cornea and commander with personal cloak+area cloak modules are affected. Iris is not affected because it has no self-cloak. Commander with one but not both of (personal cloak, area cloak) is also not affected. See screenshots. Note the area cloak states and energy usage. Now there is another problem, which is that personal cloak costs no energy if the area cloak is enabled but the unit is not making an area cloak (screenshot). The radar jam state being off turns off the area cloak, but the area cloak state still affects energy use. Ok. Reverting the fix for now. Why there are 2 different states to begin with? Why cloakers have On/Off status and Area cloaker enabled/disabled? The on/off toggle is for radar jamming. I believe in the past you could cloak without jamming (affected units would still show up as radar dots) so two separate states made sense. Nowadays areacloak requires jammer but the two buttons were kept because it would require a bit of hackery to do the "natural" three-state button - the onoff toggle is two-state but it is the only way to use native jammin', so a three-state toggle would need to mess with the onoff state on its own. Patches welcome.